A sixth grader in north-central Vietnam had to be hospitalized after he was repeatedly slapped in the face by his classmates as a punishment from his teacher for allegedly using foul language in class. The incident took place at Class 6.2 of Duy Ninh Middle School in Quang Ninh District, Quang Binh Province earlier this week, local education authorities confirmed on Saturday. 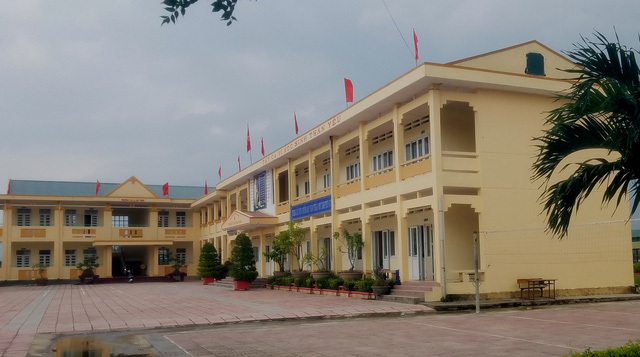 Leaders of Duy Ninh Middle School have been required to take disciplinary actions against Nguyen Thi Phuong Thuy, the math teacher who asked the whole class to give their classmate at least ten slaps each. Thuy was suspended from work pending her final punishment. The student in question, referred to only as N., was discharged from the hospital and is receiving treatment at home, with his cheeks remained swollen. The family said N. will return to school next week, adding that Thuy did visit and apologize to the student. Tran Thi Chuoc, mother of N., said she was stunned to see the swollen cheeks of her son when he came home on Monday afternoon. The student told her mother that Thuy asked the whole class to repeatedly slap him. It all started when the student sitting next to N. accused him of swearing, only because he had read a sentence containing the name of her parent. In Vietnam, primary and middle school students may call out the names of their classmates’ parents as a form of teasing and, in some cases, bullying. Upon receiving the ‘complaint,’ Thuy immediately asked each of the remaining 23 students of the class to slap N. ten times. N. suffered all 230 slaps to his face. When the last student hit him, N. said “I hate you teacher,” only to get the 231st slap, this time from the teacher herself. Chuoc said she had to rush his son to the hospital for treatment. He was diagnosed with soft-tissue injuries and still has difficult opening his mouth, chewing and eating. But more importantly, he is severely psychologically hurt by the incident, according to the mother. The schoolmaster, Pham Thi Le Anh, said Thuy was asked to write a report about the incident. As per the school regulations, any class whose students are found swearing will lose ‘five points’ in the internal awards system, so Thuy must have acted under pressure. The schoolmaster asked for the family’s sympathy over “the inappropriate way of handling the situation” of the teacher.